Our explorations of Laos have taken us into the largely roadless eastern Phongsali Province. The main artery into the region is the Nam Ou, a river that cuts through some dramatic karst scenery, stretches of jungle, and a series of river villages accessible only by boat. The region is quite beautiful, although the hideous, smoke-filled skies kill the thrill a bit. Traveling here is time-consuming and tough, harkening back to the “good ol’ days” when the journey itself was the attraction. Gone are the tourist hordes, instead each turn reveals a riverscape recalling another age. Our journey up the Nam Ou is taking place very late in the dry season and river travel will be coming to an end at any moment. Our boat pilots were extremely skilled and quite cautiously navigated the rocky outcroppings, underwater growth, and sand bars, all of which become much more challenging this late in the season. We really thought a dip was inevitable when, half-way up a steep staircase of rapids, our propeller broke and we started to slide backwards down the river. Amazingly, our pilot gunned the motor and struggled against the current managing to reach the top of the rapids with only half a propeller. I was quite impressed, but clearly this was all in a normal day’s work. After slowly making our way to the next sandy river bank, the pilot opened a wooden box to reveal half a dozen new propellers. He popped a new one on and away we sped towards the next set of challenges. 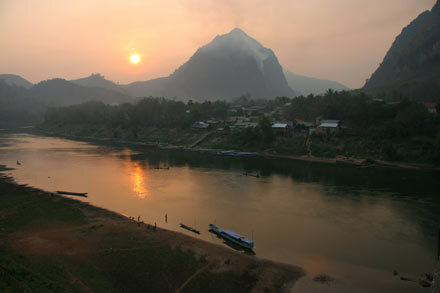 Traveling Laos’ backcountry rivers is definitely a highlight of travel here. Unfortunately, new roads and high gas prices are making river travel less and less common in a country that used to travel extensively by river. That’s a bummer because epic river trips through the wilderness are hard to come by these days. You can travel from Luang Prabang all the way to Hadsa Neua near Pongsali. We did the stretch from Nong Khiaw to Hadsa Neua with an overnight stop in Muang Khua. This trip takes about two days by motorized boat, but boats do not always run daily, so there might be some waiting involved. The best time to travel the river is from November to February. In March, river levels can get so low that navigating the river becomes harder and river boats may stop service for a period of time. December and January can be quite cold, making river travel uncomfortable. Remember that field burn-off continues from mid-March through May. Travel in Laos is not recommended during this period.